Children's Books that reluctant readers will read over and over again. Here is a collection of children's books that I have had in my classroom library over the years. I have noticed in that time that they are favourites of all kids in the age group but especially the guys that aren't so keen on reading. These children's books offer many experiences that get the kids talking about what is in the book. You need to celebrate the books with them. 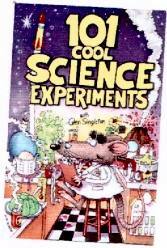 101 Cool Science Experiments - get the lads reading stuff and deciding which experiments they'd like to try. You might need to but a few ingredients but it gives the lads a real context to read in. 101 Cool Practical Jokes - Yep. OK we've seen most of them before but if you celebrate the tricks and pretend like it is the first time you have ever seen them the kids will be inspired to impress you. 101 Cool Magic Tricks- set them the task of performing a magic show for - you, your family - grandparents - video for YouTube etc.